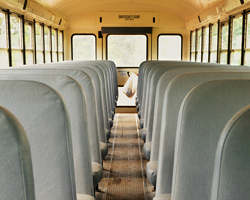 Early every Sunday morning, a faithful group of caring bus workers head into the city of Elmira and the village of Horseheads to pick up children, teens, and adults in order to bring them to church. Many of these children are underprivileged, and the love of Christ that they receive through the bus ministry is the highlight of their week. This ministry is staffed by dedicated volunteer Christians who love people and are carefully trained to work with children. To find out more or to request a ride, feel free to contact us here or call the church at (607) 739-9062.